My great-grandfather John Murray Smith (1838-1894) hardly looks like a man of mystery. He was a banker with gentle eyes, mutton-chop whiskers and a mustache. But there is at least one mystery about him: how did he acquire that giant bible? What could a young banker have done that someone thanked him with such a present? I googled William Coldwell and discovered there was a journalist by that name working for the Toronto Globe newspaper in 1867. Aha, I thought, perhaps Coldwell wrote an article in the Globe about whatever it was John had done, but a search brought no hits. John Murray Smith was born in 1838 in MacDuff,3 a town on the Firth of Moray, Scotland, where his father, James Avon Smith, was a teacher. His mother, Jane Tocher, died a few weeks after his birth,4 leaving his father with seven children to raise. His father remarried to a Mrs. Daly and Aunt Elizabeth Tocher helped to bring up the children. 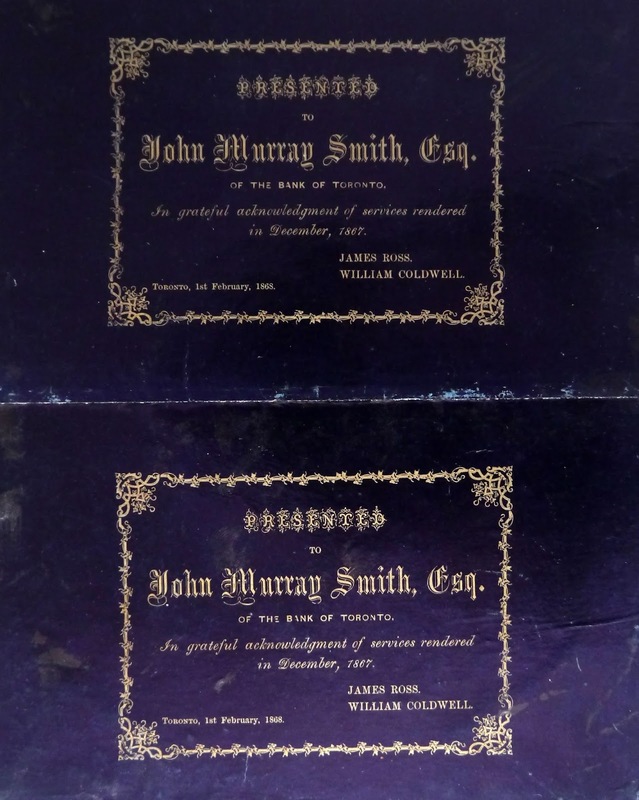 According to an unpublished Smith family history, James Avon Smith left Scotland for America around 1846, eventually settling in Toronto, where he got a position teaching classics. Three of the children came over in 1848, and John and the other three followed in 1852. He married Jane Mulholland of Montreal in 1871.6 She was the daughter of Henry Mulholland, an Irish-born hardware merchant, and Ann Workman, the only sister of several of the city’s prominent businessmen. 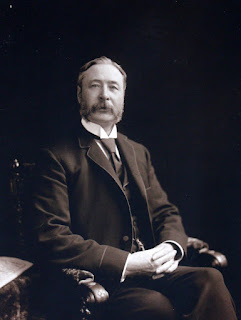 In 1877, J. Murray Smith, as he was known to his business colleagues and customers, was transferred to Montreal, at that time Canada’s largest and most important city, as manager of the Bank of Toronto’s branch. In 1881, the Murray Smith family moved to a two-story stone house on McGregor Street, a fashionable address on the slope of Mount Royal.8 From the front of the house, they would have looked toward the trees of Mount Royal Park and, from the back garden, they would have seen the St. Lawrence River in the distance. John also purchased real estate as an investment. In 1890, he acquired five adjoining building lots on Charles Borromée Street from Robert Stanley Bagg. The following spring, he purchased five more lots on the same street.9 He probably built brick or stone or row houses and sold or rented them. John died of heart failure at age 57, in Beaurepaire, on July 25, 1894,11 and he was buried two days later at Mount Royal Cemetery. He had been a good businessman and the solid investments he left to his family meant that, although they sold the summer house, they were able to remain in their McGregor Street home for many years. 1. 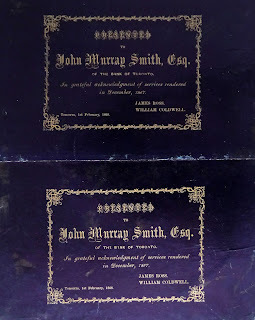 “Men of Canada: The Late John Murray Smith,” W. Cochrane, The Canadian Album, 1896, p. 131, https://books.google.ca/books?isbn=5882975107 , accessed March 4, 2016. 2. Montreal was home to the first YMCA in North America. When the Montreal YMCA was set up in 1851, it had strong connections to Protestant churches, but it became open to people from all churches. Its goal was to put religious teachings into practice and to lead by example. The Montreal YMCA began offering night classes to citizens and immigrants in the 1870s. In addition to reading rooms and lectures, the YMCA also made physical education programs available. 4. Jane Tocher died Feb. 28, 1838, aged 35, according to the gravestone inscription in Doune Kirkyard, MacDuff, Banffshire, Scotland. 6. “St. George’s Anglican Church, Ste-Anne-de-Bellevue, Quebec,” Quebec, Canada, Vital and Church Records (Drouin Collection), 1621-1968 [database on-line] (www.Ancestry.ca, accessed March 1, 2016), entry for John Murray Smith, October 4, 1871, citing Gabriel Drouin, comp. Drouin Collection. Montreal, Quebec, Canada: Institut Généalogique Drouin. 7. 1891 Census of Canada, database. Ancestry.com (www.ancestry.ca: accessed March 2, 2016), entry for J. Murray Smith; Citation Year: 1891; Census Place: St Antoine Ward, Montréal Centre, Quebec; Roll: T-6407; Family No: 21, citing Library and Archives Canada. Census of Canada, 1891, Ottawa, Ontario, Canada: Library and Archives Canada, 2009. www.bac-lac.gc.ca/eng/census/1891/Pages/about-census.aspx. Series RG31-C-1. Statistics Canada Fonds. Microfilm reels: T-6290 to T-6427. 8. Theo. Doucet, N.P. #105552, 29 April, 1881, Deed of sale. Author’s files. 9. John Fair, N.P. 13 Jan. 1890, Deed of sale R. Stanley C. Bagg et al to John Murray Smith,and John Fair, N.P. 24 March 1891, # 28434, Deed of sale from Robert Stanley C. Bagg et al to John Murray Smith. Abner and Stanley Bagg Fonds, McCord Museum, Montreal. This book notes that J. Murray Smith’s summer house was on Thomson Point. Two Toronto real estate brokers had purchased the Thomson farm in 1891 and subdivided it into lots. The point was described as “one of the most picturesque on the whole Island of Montreal.” I have not seen a photo of the Murray Smith cottage but, if it was like others in the area, it was likely a “massive fantasy in wood,” complete with turrets and balconies. Summer residents commuted from the city to their country houses on the lake by train, and the developers had entered into an agreement with the Grand Trunk Railway Company to build a station at Thomson Point. 11. ” St. Paul’s Presbyterian Church, Montreal, Quebec, Quebec,” Canada, Vital and Church Records (Drouin Collection), 1621-1968 [database on-line] (www.ancestry.ca, accessed March 2, 2016) entry for John Murray Smith, July 27, 1894; citing Gabriel Drouin, comp. Drouin Collection. Montreal, Quebec, Canada: Institut Généalogique Drouin.